USA Kitchens and Flooring is the area's best kitchen and flooring showroom. 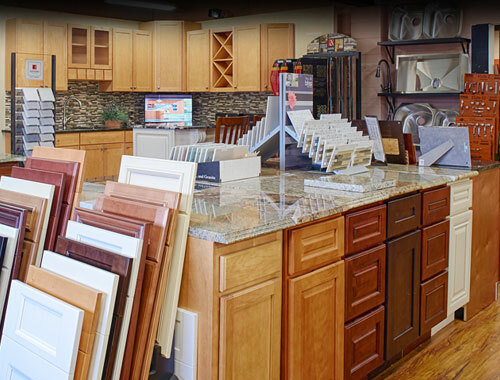 We carry a wide selection of cabinets, countertops, carpeting, wood, tile and other flooring options. Come in and let our design specialists help find the best options for you. Granite is one of the most versatile and durable materials, which also adds style and elegance to any room. From selection to installation, we will guide you through the entire process and ensure that you are satisfied with the finished results. Our hardwood flooring adds unmatched beauty, durability and longevity to your home or commercial space. We are committed to providing you with a quality hardwood with the integrity and character that matches your needs. Offering a wide selection of tile, we can provide you with the building blocks to bring your creative vision to life. Whether it is porcelain, granite or ceramic, we carry a wide range of products to ensure a perfect fit for your project. Laminate flooring offers the convenient advantages of versatility and durability. Whether it is for residential or commercial use, we can provide you with the perfect option that fits both your design and budget needs. Unique and sustainable, our vast selection of luxury vinyl flooring reflects both style and durability. Click lock installation and 100% waterproof patented flooring that provides the look of real hardwood or natural stone. Visit USA Kitchens and Flooring today at our convenient location at the Route 42 Creek Road Exit in Bellmawr, NJ. Shop our 3,000 square foot showroom Design Center and choose from hundreds of offerings in hardwood flooring, laminate flooring, wall to wall carpet, ceramic tile, vinyl click lock flooring, cabinetry, granite and quartz countertops as well as glass and stone backsplashes. Whether you are working on a DIY project or prefer full service installation through our network of local experts, we have options to suit all your needs. Call us at 856-931-3301 to schedule an appointment at our showroom with one of our four Design Specialists located in our 3,000 sq. ft. showroom. We also offer customers 0% financing through Syncrony Bank. Upgrading your kitchen? Allow us to work with you to create the kitchen of your dreams. Set up an appointment with one of our four kitchen designers who can assist you in redesigning and enhancing your current space while developing a budget based on your preferences for flooring, cabinetry, counter tops, backsplash and hardware. We also offer an in stock all wood cabinetry selection that is unmatched with over 70 door styles available through our quick ship program.